At Sheng Li, we are often faced with the challenge of repurposing a brand’s digital strategy to connect with multiple international audiences. This means taking content used to reach users in China, to build a relationship with the Chinese demographic in North America and Europe. It is important to keep in mind that maintaining your brand’s voice also means crafting an audience-specific strategy to share the same message in multiple languages. What is your brand’s key message? Who and where is your audience? What specific qualities can be highlighted to connect to the Chinese demographic living/traveling overseas? What makes sense for repurposing? Think about your content. What are you trying to communicate? For example, a generic campaign relating to a product launch might be marketable to all countries; whereas, an event-specific announcement for a store opening or limited edition item, is geographically particular. How do these brands manage global and localized content? 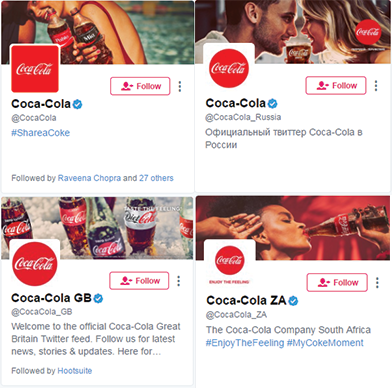 Let’s take a look at a few international brands on Twitter. 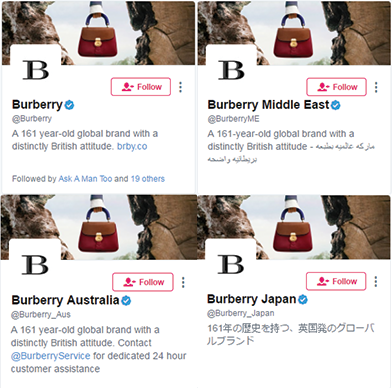 Burberry has adopted the strategy of a corporate account, in addition to country accounts on Twitter. 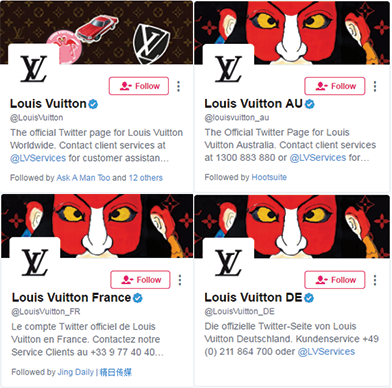 Louis Vuitton has adopted the strategy of a corporate account as well as country-specific accounts for localized communication. Coca-Cola, as a consumer brand, is also utilizing the strategy of corporate and country-specific accounts. We think that the strategy of having a centralized brand account and country-specific accounts for localized communication could also work well on Chinese social media platforms such as Weibo and WeChat. However, your brand should think about how content on localized accounts will be unique, in order to differentiate from your primary accounts. Brands can promote localized accounts through various strategies, such as paid advertising, partnering with local KOLs, or hosting local contests. In addition, having localized accounts would provide regional brand managers with more control over what is being communicated to their customers in the geographic market that they are responsible for. Ready to Reach the Chinese Market?